But thank God got through surgery ok yesterday. And thanks to all for love support and prayer. As a doctor I've long be interested in what it is like to be on the other side of the desk. In other words, what is it like to be a patient? And since personal experience of being a patient may lead to a more empathetic way of practising the art (see chapter 8 'Seeing the world through patient's eyes' in my book The art of General Practice), I would suggest that it is a good idea to read what other doctors have learned from their illnesses. 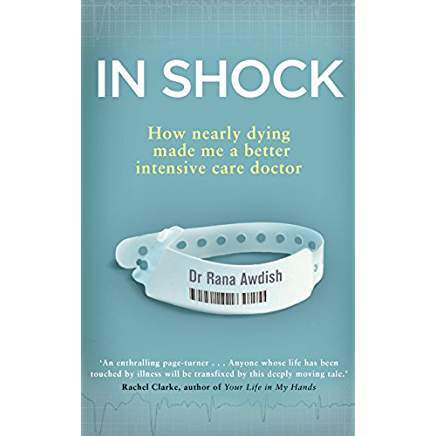 Such a one is Dr Rana Awdish who tells all in In Shock: How nearly dying made me a better intensive care doctor. It is a salutary tale of serious illness which not only affected Awdish's physical well being-indeed she came within a whisker of dying- but also during the many times when the health professionals attending her said the most hurtful, unhelpful and thoughtless things, and consequently her stress and sadness were magnified. 'The baby, she told me, was evacuated from my uterus still encased within the amniotic sac, and the placenta fully separated. A complete abruption, which has the distinction of being the worst-possible scenario. The connotation was that at some indeterminate point earlier in the evening, the placenta had detached from the uterine wall, depriving the baby entirely of any blood supply. The baby was delivered already" dead. They attempted to place a breathing tube, and were successful, which she appeared to be proud of, but the baby didn’t respond to their efforts. The baby weighed less than a pound. She spoke with precision and an intentional gravity. She reminded me of the military officers that would arrive on the doorsteps of widows. I guess the length of the quote prompts me to say my one critique of this devastating and fascinating account of a doctor and her illness. I believe the book could have been half as long and just as powerful, its not that it is a particularly long book, just longer than needs be. There was insensitivity, not only the neonatal nurse quoted above, but also the hospital that sent a bill for the unsuccessfully resuscitated 27 week baby, on what would have been her birth date (thankfully not something that would happen in our struggling NHS). There was skepticism shown by her doctors when she clearly required stronger pain relief, and so felt guilty for asking since they thought she might be an opiate addict. At times she seems obsessively reflective and self analytical, and I suspect would be a rather challenging patient to manage. The detail she records is at times encyclopaedic (in the acknowledgments she thanks at least 50 people by name) and somewhat repetitive, but there is so much to learn here for the practicing doctor. Alas the books length may put my fellow medics off-I hope it doesn't. After this beautiful Bank Holiday weekend I suspect not everyone is feeling sunny. And looks can be deceptive. In the extraordinary short story, A perfect day for bananafish, J D Salinger (he of Catcher in the Rye) depicts a tender encounter between a sweet little girl called Sybil and a much older man, Seymour, who gently, and innocently takes her out on a float in the shallows of the sea off Florida. Sadly Seymour is not as carefree and happy as the story at first appears. But I won’t spoil it for you! There are many Seymours around us. I think of a bereaved widow I know who’s world was shattered by the sudden death of her husband. She would greet me with a timid version of a smile that hid a mountain of sadness. But smile she would. That splendid GP educational organisation Red Whale helpfully sends out updates from time to time, and a recent one was on the subject of grief and abnormal grief. It’s a helpful reminder of how all pervading and bewildering the experience is. Summarising 2 recent BMJ articles it reminds us that grief has many faces, and can be subtle in its effects. Impaired functioning: within the family, socially, ability to work/go to school. Intense yearning and sadness, emotional and physical pain. There may be physical symptoms of anxiety. Mental fogginess, difficulty concentrating, forgetfulness. Loss of sense of self or sense of purpose in life. Feeling disconnected from other people and ongoing life. Difficulty engaging in activities or making plans for the future. That disconnected person who just can’t get themself going maybe hiding a grief unknown to those around. And since grief has many causes, although it has death at its heart, this may not just refer to physical death. There can be death of status through loss of job, by illness, redundancy, retirement or divorce. Loss of a dreamed for future is a kind of death which may only be known to the afflicted. I'm thankful that there is increasing emphasis on the need for resources and attention to be drawn to mental health issues. I recently re-read Reasons to stay alive by Matt Haig and felt again the sympathy that is due to the sufferer and the sheer sense of physical pain that low mood can produce. It is indeed agony. I recall an old patient of mine whose dog had died. The old chap was single, disabled and his dog was his life. The dog died in the middle of the night and my patient called for an ambulance to move the dog onto his knee. Fortunately the paramedics took pity and obliged. I suspect our NHS accountants are less than impressed. But grief is grief whatever the source and is equally shattering. Lets try to be aware of each other's grief, whatever the cause. 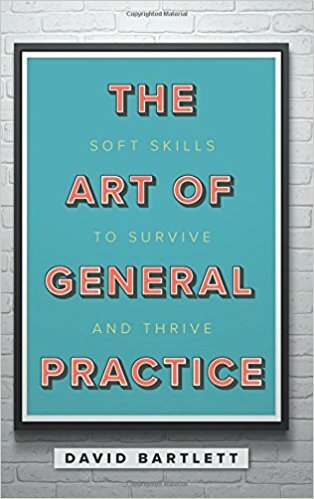 So my wee book, The Art of General Practice on soft skills for GPs is finally published today. The publishers bumpf on the back is mostly true! The Art of General Practice is a short text written by an experienced GP and GP trainer. It is a book which will help focus the mind of the reader (GPs of all decriptions: young GPs, returners to general practice and even jaded GPs) on what it means to be a GP. Too often general practice focuses on guidelines, ever-changing targets, incentives or the academic side of medicine and the art and craft of being a GP is forgotten. This book aims to redress the balance; it helps the reader refocus on the emotional intelligence needed to be a great GP. 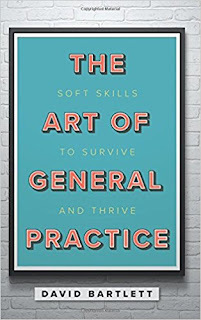 The book consists of a number of short chapters so the busy GP can dip in and out of it as time allows; each chapter helps the reader re-centre on the core skills and techniques needed to be a great GP, and the benefits these skills will bring to both GPs and patients alike. There is almost no medicine in this book; it is a book of life experiences, anecdotes and suggestions all aimed to help you survive the increasing pressures of general practice and make your life as a GP more interesting and less stressful. Breakdown The Crisis of Shell Shock on The Somme 1916 by Taylor Downing is a brilliant examination of the psychological effects of prolonged exposure to danger and death. Thousands of young men from all walks of life volunteered to serve in Kitcheners New Army, many of them joining what became known as the Pals regiments. And it was alongside their pals that many witnessed and experienced horrible suffering, mutilation and overwhelming fear. Is it any wonder that many of them developed bizarre symptoms of shaking, unsteadiness, paralysis and a variety of other effects, which baffled the medics of the day. Downing provides a balanced treatment of a truly difficult subject. During the conflict the military authorities tended to take the view that such men might be malingerers and cowards and that the effect on colleagues would be somewhat infectious, making them unfit for battle. It resulted in what was known as 'wastage', such that numbers of fighting men were not only reduced by physical wounds inflicted but also by profound psychological damage. Hence a hard ,line was generally taken. Some of the treatments attempted were truly barbaric and callous. The opinion of medical officers attached to regiments was often ignored since it was felt that they were too sympathetic. Men who were clearly suffering from intense anxiety were forced back to the front, some of whom survived the war physically but never adapted to life after the conflict was over. For me it raised the difficult issue of what we would now know as Post-Traumatic Stress Disorder. 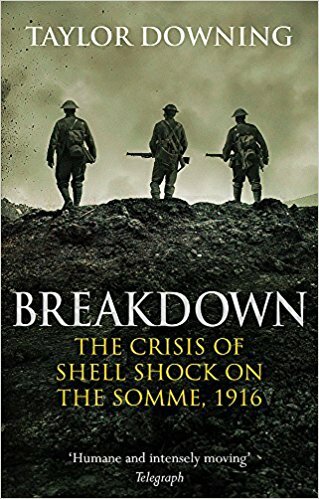 However this is somewhat different to the shell shock ( a term which the military wanted to stop using during there conflict) of the men of the Great War. Trench warfare, with its claustrophobia, vulnerability to shelling, being buried alive, and with dismembered rotting bodies all around, resulted in a specific kind of anxiety neurosis. It caused an odd mix of what we would generally recognise as hysterical (conversion) symptoms and signs as well as profound fear and anxiety. PTSD however is by definition a mix of symptoms following the index trauma, associated with flashbacks, headaches and depressive symptoms. To what extent is it a helpful diagnosis when the same experience is shared by many but only some have symptoms of PTSD? Do some of us have a predisposition or vulnerability as a result of our upbringing, genetics and personality? And how is it managed? For the modern GP there is always the challenge of encouraging hope and optimism of recovery in our patients on the one hand, whilst empathising with the symptoms experienced on the other. In other words how do we detect and help the 'malingerer' (terrible word that it is, we all know what we mean), to move out of the adopted sick role, whilst allowing for the reality of what only the patients themnselves knows that they are feeling and thinking. Our medical and military predecessors struggled mightily to get the balance right and its salutary to read of the various approaches in this superb book. But it is a reminder of just how difficult the management of psychosomatic illness is and probably always will be. Blimey am I that old? So 13th April 1978 I finally qualified as a doctor. It had been a long journey. My first inkling of wanting to be a doctor was around about the age of 15 years whilst visiting a local geriatric hospital. It was Christmas and my church youth group were singing carols to the inmates. I'm not sure how melodious we sounded but we were at least enthusiastic. Getting in to medical school was challenging and I failed to get the grades needed for Leeds Medical School first time round. So I went to work for a year as a theatre porter, re-did a couple of A levels in an evening class and at the last minute (well two weeks before the start of the course) snuck into Westminster Medical School (presumably because some other poor soul didn't get the required grades). I was sent to Kings College London for the 2nd Mb and then on to Westminster. 1. It is a privilege to be a doctor. Patients of all ages, ethnicities and status put their trust in you, and offer body and soul, even though you may have never met them before. 2. Medicine is endlessly fascinating and life-long learning is vital. I continue to want to learn, both to broaden and deepen my knowledge. I'm glad I have been willing to learn from multiple sources. Medical textbooks, literature, colleagues, patients, personal experience of illness, 'popular ' medical books written for the general public etc etc. 3. It's usually harder being a patient than it is being a doctor. It's good to remind yourself of this from time to time. 4. Every patient has a context. Each will have been brought up in a certain way and will have their own unique combination of life experiences. These will have a major impact on how well they cope with symptoms, uncertainty, doctors, diagnoses and everything else. 5. Most patients are incredibly brave in the face of terminal illness and death, but giving space and time for them to address their fears is crucial. 6. Mental health symptoms, whether from depression, anxiety, or other such illnesses, are agonising and such patients deserve all the help and support we can muster. 7. As in many other fields of work, you won’t often receive thanks and expressions of gratitude, but when you do it’s very touching. 8. Like a West End actor, each performance matters. And so each patient contact is unique and deserves our best attention. We especially need to be reminded of this if we have just had a difficult consultation or similar as we go to our next patient. 9. Kindness matters. Not only for our patients-and what patient doesn’t want the doctor to be kind, but we need to be kind to ourselves. Caring for ourselves physically, emotionally and in every way as best we can. We are not God and have our limits. 10. Seeing so much illness and suffering over the years musn't make us cynical. Rather I chose to look forward to the time when there will be ‘no more tears and no more pain’. It’s the great Christian hope that there will be a time when God fixes everything, when ‘everything sad will come untrue’ (thank you Tolkien). It's always a bit chancy to give someone a book. A little like recommending a restaurant. Will others like it? Will the service be as good? Etc. And so recently a friend gave me The Long Walk. it proved a great choice. It tells a remarkable story of endurance, deprivation and at times great tenderness. It concerns a young Pole who was wrongfully imprisoned and sentenced for being a spy. Arrested in the early part of the Second World War, after a mock trial he was sent to Siberia to serve 25 years of hard labour. Joined by a small band of other escapees he set off on a 4000 mile journey on foot across the freezing wastes of Siberia, the barren intensity of the Gobi desert and the forbidding Himalayas. Along they way they are joined by young 17 year old Kristina who is also fleeing the Soviets. Her interaction with the hardened men is remarkable and touching. They experienced all too brief times of kindness, hospitality and generosity, as their paths crossed with solitary shepherds and hunters. These times really were wonderful examples of what theologians would call 'common grace'. Having read he book and throughly enjoyed it a web search throws up a lot of debate around the veracity of the book (see here...although this is 'only' wikipedia ) amongst much else. 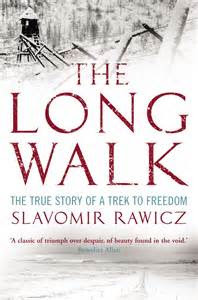 I'm not in a position to judge, but I suspect that the book is probably a gathered up collection of the stories of various Polish ex-prisoners. Powerful all there same. Yet again, just as after reading about our forbears who endured the rigours of the Great War, or those who explored Antartica at the turn of the 20th century, I'm left humbled and wonder how well the majority of our current generation would cope with such adversities.